The 2013 DHS Conference program booklet. 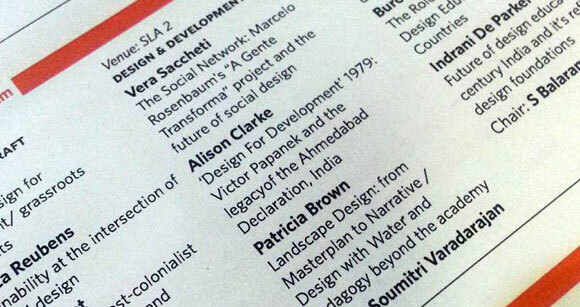 In September 2013, I participated for the first time at a design conference, taking part in the 2013 Design History Society Annual Conference “Towards Global Histories of Design: Postcolonial Perspectives”. It was truly an honor to be among such talented academics and historians, and I was thrilled to be able to present in such a fantastic context as the National Institute of Design in Ahmedabad, India. Beyond the fantastic exchanges I had with all those who participated and attended, I was also able to present the continuation of the research I started developing with my masters thesis at D-Crit, presenting on contemporary social design projects and particularly Marcelo Rosenbaum’s A Gente Transforma initiative. An excerpt of my paper can be read after the jump. For the September/October 2012 issue of Frame magazine, I wrote a feature article on the current state of social design, and focused on a few projects that I believe are shaping the future of the field. One of them is A Gente Transforma [“We Transform”], a project by Brazilian designer Marcelo Rosenbaum (pictured above). The text dovetails with the research I have developed for my masters thesis, and continues my investigation into a direction which I hope to further explore in the future. An excerpt of the piece can be read after the jump.